CCleaner tops our list of free registry cleaners for several good reasons. Aside from being completely free and working with all versions of Windows, two additional things really stand out. For one, I've never had CCleaner cause a problem in the Windows Registry, which some less-well-done registry repair tools do on a regular basis. And two, because it's optionally available in a portable format (i.e., it doesn't need to be installed). Read our full CCleaner review below for a list of features, pros & cons, my opinions on the program, and some basic instructions, or head straight to their download page linked above. Please download CCleaner from Piriform's site only (CCleaner.com), which we've linked to above! There are malicious programs that look and sound like CCleaner but charge for the cleaning. See Why Is CCleaner Asking Me to Pay? for more. This review is of CCleaner v5.56.7144, which was released April 9, 2019. Please let me know if there's a newer version I need to review. CCleaner works with 32-bit and 64-bit versions of Windows 10, Windows 8 (including Windows 8.1 & Windows 8.1 Update), Windows 7, Windows Vista, and Windows XP. Two installation methods are available. The first is referred to as "Installer" and is a full install of CCleaner, which includes an option to also install Google Chrome and the Google Toolbar for IE. The second is the "Portable" version, which we recommend, and doesn't require installation at all. A "Slim" version is also sometimes available, which is the same as the "Installer" option but without the Google software installation options. CCleaner is actually more than just a registry cleaner tool. It's probably more accurately called a system cleaner because it actually cleans a lot more than just your registry. As far as the registry cleaning functions are concerned, CCleaner, like all registry cleaners, is primarily concerned with removing entries in the Windows Registry that refer to files, programs, or other resources that no longer exist. For example, CCleaner will remove registry keys and registry values that point to programs and files that no longer exist in Windows. These abilities are exactly why running CCleaner, or another well-designed registry cleaner, is a great troubleshooting step when faced with a "missing file" or "cannot find a file" sort of errors, especially as Windows starts. Specifically, CCleaner will remove registry entries that point to the following if they no longer exist: DLL files, file extensions, COM/ActiveX objects, type libraries, applications and application paths, fonts, help files, installers, sound events, and services. Outside of the registry, CCleaner also removes temporary browser data like cookies, history, and the cache from all popular browsers. You can also do things like empty the Recycle Bin, clear MRU lists, empty the thumbnail cache in Windows, remove old memory dumps and log files, and much more. 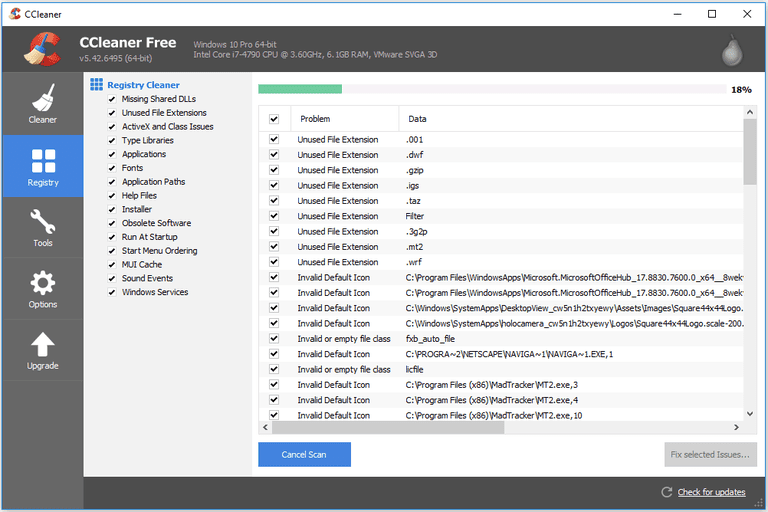 CCleaner also has a "Tools" area where you can automatically uninstall programs, view and change the programs that startup with Windows, find and remove files that are taking up lots of disk space, find duplicate files, remove restore points, and even wipe a drive. If it's not obvious already, I love CCleaner. It's tiny, fast, and thorough. It doesn't advertise to fix all the problems under the sun like so many "registry repair" tools do. It does what it does and that's good enough. I like that. I very much like that there are two ways to "install" CCleaner. And while I'm usually a very big fan of portable programs, one advantage of actually installing CCleaner is the addition of Run CCleaner and Open CCleaner right-click options to your Recycle Bin. If you're planning on using CCleaner for general system cleaning, this is a really handy feature. My only real complaint about CCleaner is the confusing download page, which you can see here. While I link to their much more clear builds page elsewhere in this review, the standard CCleaner download page that most people end up on is a little confusing. On first glance, their download page makes it looks like you have to pay for CCleaner if you want it to actually do something. I actually get regular emails about CCleaner being not free. However, it is free, but you can choose to pay for their Professional or Business Edition versions and get personal support, a software updater, and a few other features. CCleaner Free functions 100% and will not prompt you to pay for anything to complete any of the tasks. Another trivial problem I have with CCleaner is that at the very start of the installer, you're asked if you want to install another program along with CCleaner. I've seen Avast! Free Antivirus advertised here but others might be, too. If you don't want anything but CCleaner, just uncheck whatever program is mentioned, and then continue installing CCleaner normally. In summary, if you think a registry cleaner is necessary to solve some computer problem you're having, I highly recommend you choose CCleaner. If you're interested in some of the other really cool system cleaning features, know that among those programs, CCleaner is also probably your best bet. It's simply a fantastic program. Piriform, the company behind CCleaner, also makes a number of other free and highly rated system programs like Recuva, which is a free data recovery tool, and Defraggler, a completely free defrag program, and Speccy, a free system information utility. CCleaner is easy to install. Just head to their builds page and choose the installation option you'd like. Choose "Installer" or "Slim" (if available) to install CCleaner as you would any normal program. Choose the "Portable" version if you'd like to run CCleaner from a flash drive or would just rather not install yet another program on your computer. You'll need to unzip the program before running it in that case. Select the Registry icon on the left. Under the Registry Cleaner heading, make sure all of the options are checked. If you have a good idea what you'd like CCleaner to "clean" from the registry then, by all means, limit the selection. For example, if you're receiving an error when Windows starts about a program you no longer have installed, you could probably leave only the Run At Startup checked. Choose Scan for Issues. CCleaner is done scanning your registry for unnecessary entries when the green progress bar at the top of the screen reaches 100%. If you decide to cancel the scan midway through it—maybe because it's taking too long to finish — you'll still be able to fix what was found before you cancelled it. While all of the registry entries that CCleaner found are checked by default, you can uncheck any entries you want to keep. One of the great things about CCleaner compared to its competition is that it doesn't go overboard. You're probably safe removing anything that it finds. Select Yes on the dialog box that asks "Do you want to back up the registry before making changes?". If you aren't asked about backing up the registry, you can make sure you are next time by enabling Show prompt to backup registry issues in Options > Advanced. Choose an appropriate place to save the REG file and then pick Save. This REG file can be used to undo the changes CCleaner is about to make to the registry. See How to Restore the Windows Registry if you later decide to use the REG backup. On the next screen, choose Fix All Selected Issues. You could also choose Fix Issue to remove every entry one at a time, but chances are you're not sure which entries should be kept or deleted. Fortunately, CCleaner does a good job at determining that for you, so you're best off just removing all of them at once, especially if there are hundreds or thousands. Select Close after all the changes are complete. This might take just a second or two, up to several seconds, depending on how many registry keys CCleaner is removing or changing and how fast your computer is. It's now safe to close CCleaner or perform some other system cleaning task with the program. It's a good idea, however, to repeat the above steps again even if you've just completed a registry clean-up with CCleaner. A repeat scan is necessary since some items that were previously removed might create further objects that need to be removed, in which case only a second scan (or third or fourth, etc.) is necessary in order to delete those new orphaned entries. If you run an additional scan and the results are the exact same as the prior scan (i.e. the same entries were removed in both instances), you can quit repeating the clean-up process. One reason this might happen is if a process needs those entries, and so the system is rebuilding them even after you delete them. CCleaner is fully documented on Piriform's website and is a great resource if you need some help.